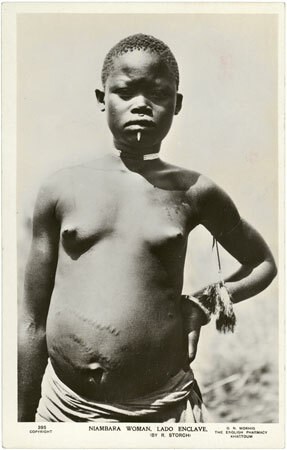 An upper body full face postcard portrait of a Bari (Nyambara) girl with cicatrices on her abdomen and a lower lip ornament. Notes on postcard - "395 Copyright. G.N. Morhig, The English Pharmacy, Khartoum. Niambara Woman, Lado Enclave. (By R. Storch)"
Morton, Chris. "Portrait of a Bari girl" Southern Sudan Project (in development). 03 Jan. 2006. Pitt Rivers Museum. <http://southernsudan.prm.ox.ac.uk/details/1998.88.43/>.